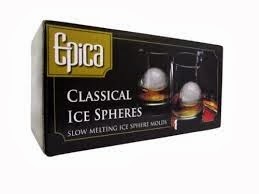 I really like these ice spheres from Epica. They keep your drink really cold for a longer period of time. My kid's think these are really cool. These are great if you are a whisky drinker or wine drinker to keep your beverage cooler for longer. This is great if you don't drink a lot of liquid and let it sit awhile these spheres are slow melting. Quality materials and construction ensure years of carefree use, helping you entertain guests at all sorts of get-togethers from children's parties to sophisticated cocktail soirees. We really love these and I love to use these especially for the kid's they are not ones to chug their drink so these keep them nice and cold for them.